Starting over, I think that's what I thought it was. It was my operating paradigm for several weeks as I contemplated being confirmed in the Episcopal Church. It was the first threshold that I noticed as I perused all of the steps toward being received as a priest of the Episcopal Church. I'm not thinking about "reordained" yet - it's a dark place that I'm not prepared to go at this point. Confirmation seemed like a reasonable point at which to begin to wrestle seriously with all the exigencies of my plan. Here I was, standing around the Great Font at Grace Cathedral in San Francisco, rehearsing with several other people the baptisms, confirmations, receptions, and reaffirmations that would take place at the Great Vigil of Easter. This is place that has my own history in it already. As I entered there was the small empty niche on the façade of the cathedral where I would place Anna when she visited here, and photograph her - a history of her physical growth. Up above is the columbarium where I presided over the placement of the ashes of my friend Peggy Seubert. The main aisle I have walked down, many times, at services of healing for AIDs, for celebrations of Lutheran - Episcopal inter-communion, and the altar where I have celebrated one of the masses for AIDs in the mid-eighties. There were some of the vergers who know me by name, and the director of catechuminate at the cathedral, whom I have known for years. As he caught site of me, he dragged me off into the corner and said, "Michael, you have some 'splainin' to do!" Now, all of a sudden, I was a candidate - a novice. And there was more than that. What about Pr. Hellbusch's hands and words on 17 May 1957 when virtually the same prayer was said over me? What about my own ordination, my calls, my priestly service over the period of almost thirty-five years? It had all come down to that tactile succession. This is one of the hard places of ecumenism, as the things that you value and desire, such as the historic episcopate, come crashing into your own personal realities. It was a healthy dose of humility and loss that was troubling me. And I wasn't being private about these feelings either, having confessed my (what?...grieving? loss? doubt? pride? fear? deficiency? all of the above?) to the Vocations Committee at Trinity Church. I think I am in an ecclesiastical warp. When I explained what I was doing to Fr. Kenneth Schmidt, his response was, "Well, that's rather redundant, isn't it?" Yes, well - and there you have it. Earlier that morning, as Anna and I had breakfast at the Ferry Plaza, she looked at me and said, "Dad, you're not starting over...you're continuing on!" She went on to explain that many in my position have just given up, not attempting anything new, not seeing the goal. In 1995, I had a wonderful meeting with Bishop Swing, the bishop who would be confirming me later in the day. At that conversation, in which I explored the possibility of "jumping ship" as St. Francis faced expulsion in December of 1995. I explained that I did not look forward to serving in an "independent" church, that I was too hopeful for the catholicity of the Lutheran experiment. He countered with his own story in which he told of his desire for one thing, only having to have to give it up for the sake of his own ministry - which had then been reinvigorated. He urged me to stay at Saint Francis, to give up the regrets and to take up the ministry again. So this was just the same, giving up again for something greater. I was not alone at this event. There were others from Trinity Church. Sue, who thought her parents were Episcopalian, but hadn't practiced. She decided to be baptized. Tabitha, a wonderful young woman of 14 was being confirmed as well as a new person at Trinity, Ken. I was in the midst of this new family, and as the evening wore on the family grew and grew. Old friends came up to say hello, other people who had heard of my journey came to meet me, and others who knew nothing about it all simply greeted me. My feelings of loss, etc. began to ebb. This was not "loss" so much as it was "gain." Strengthen, O Lord, your servant Michael with your Holy Spirit; empower him for your service, and sustain him all the days of his life. And the people shouted, "Amen!". 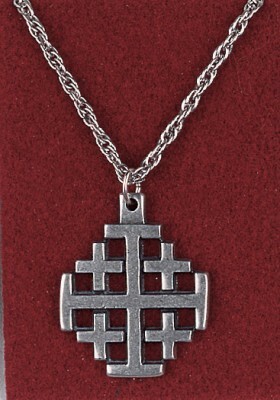 On my back and shoulders I felt the hands of Arthur, David - my rector, and Marymargaret, Tabitha, Ken, and the lady from the cathedral who would hand me a Jerusalem Cross on a chain. Later, at home, as I opened up the package in which the cross was boxed I turned it over - I wondered if it would say, "I am an Episcopalian". It didn't - it was the cross...nothing more.